Finally seeing some information on proposed Polar Security Cutter/Icebreaker designs. Got photos of this brochure (above and below) from a classmate. If you click on the photos you should be able to read them, but I’ve tabulated some information below. Fincantiari is teamed with VARD and AKER Arctic. 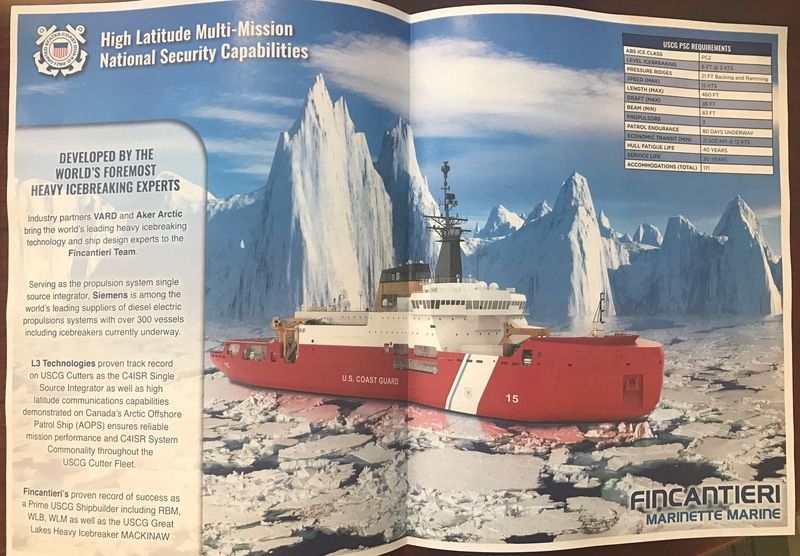 This is certain to be a major contender because VARD designed the Offshore Patrol Cutter, Fincantiari’s Marinette Marine built the Great Lakes icebreaker, Mackinaw, as well as several other Coast Guard progects, and AKER Arctic is a leader in icebreaker design. Siemens is planning the propulsion and L3 the C4ISR. Compared to the Polar Star, beam is essentially the same. Length is 61 ft greater. Draft is five feet greater. Presumably displacement will be greater than that of either Polar Star or Healy, probably close to 20,000 tons full load. Accommodations (171) are fewer than provided on the Polar Star, but more than provided in Healey. Presumably the crew will be smaller than Polar Star, more in line with Healy. Assuming 50+ scientist and an Aviation Detachment, the crew is likely about 100. Nominal range (21,500@12) is less than Polar Star (28,275@13), but still generous. This probably reflects provision of segregated ballast in the new ship. Max Speed is less than either Polar Star (18) or Healy (17), but probably adequate. As expected, no armament will be provided as built. Significantly it appears the design will provide adaptable space to meet future requirements. I’d like to hear Tups review of the design. Unfortunately there’s not much to review. The “USCG PSC Requirements” in the upper right corner refer to minimum and maximum dimensions, performance etc. defined by the USCG for the Polar Security Cutter, not the general characteristics of the Fincantieri design. Without technical data, the above-waterline renderings alone don’t tell much – it looks what I would expect for a modern Western polar icebreaker. Apart from the color, there is at least one piece of equipment that identifies it as a government-operated vessel. Anyway, this is the first PSC design we’re seeing in public. I wonder if the other bidders are coming out with their designs now that the industry leaders have revealed their cards. Do you think the hull below waterline in the artist’s rendition has anything to do with what is proposed, or is it generic? They certainly have a good team together. It’s definitely realistic, but obviously it’s impossible to say if it’s final. The knuckled side is not very common for icebreakers and resembles CCGS John G. Diefenbaker (VARD/Aker design) and RV Kronprins Haakon (Rolls-Royce design built by Fincantieri). The propulsion system is of course of great interest, but from the forward perspective it’s impossible to say anything except that it’s not a traditional triple-shaft configuration. Tups, to clarify, three shafts, provided in this case by steerable podded electric motors? Appears to be the case from what little we can see. The Canadians are, I believe using two fixed shafts plus an azimuth thruster. This proposal looks like it could be similar, or possibly two Azipods and one fixed shaft. Moose, the brochure refers to three propulsors, so I would think they are the same rather than two Azipods and a fixed shaft or something similar. Clearly the video shows something like an Azipod on the starboard side with the prop on the forward side. Chuck, I was referring to three fixed shaft lines (= the traditional polar icebreaker configuration) as opposed to steerable thrusters. Indeed, it looks like there’s either two azimuthing propulsors and a fixed shaftline at in the middle or three azimuthing propulsors – can’t tell the difference from this perspective. Anyway, the propulsion unit in the 3D rendering is definitely a pulling-type thruster. Heard(read) some dire things about this program so it’s nice to see some of the material. Would be nice if the teams we’re chatting a bit more about this, or the program office, or both. I’d still like to know why Vigor’s not in the mix considering their familiarity with the POLAR twins, if anyone has anything on that. I had expected them to look very much alike but with the Diefenbaker having shorter range, because they don’t regularly go to Antarctica like the USCG. Also surprising she (Diefenbaker) only has 22 megawatts of power (less than 30,000 HP). How did you find out the propulsion power? Didn’t see it in the specs. Anyway, you get what you ask for – six feet of ice at three knots is not awfully lot, so 22 megawatts sounds realistic for a modern icebreaker. As for size, my impression is that the USCG was looking for a more compact ship (max length 460′ vs. Diefenbaker’s 492′). The 22 megawatts is for Diefenbaker from the Wikipedia description. I may have missed something, or the description may be obsolete. Still why would the Canadian design be so much faster with relatively modest power? 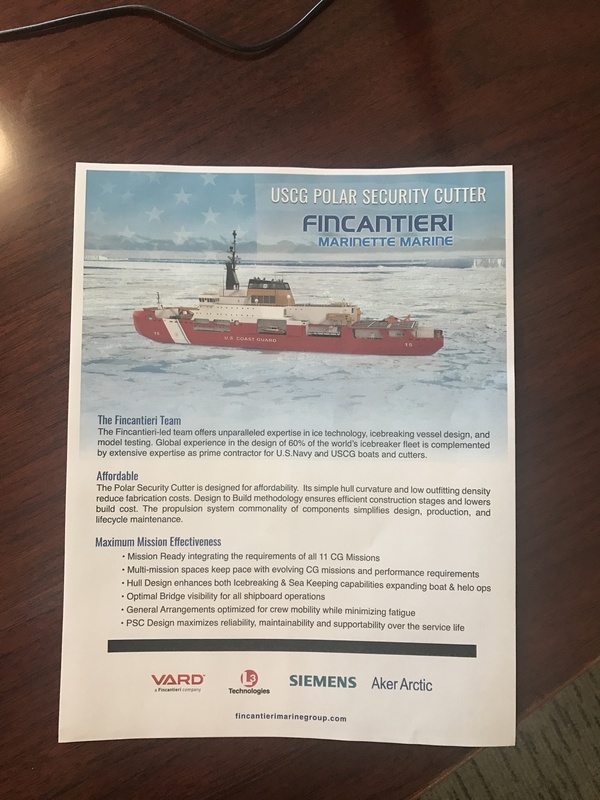 Maybe the Polar Security Cutter design is actually more capable than indicated, and they are only claiming the Coast Guard specified minimums? The Diefenbreaker has 34 megawatts of propulsion power: a single 12-megawatt azimuthing propulsor flanked by two 11-megawatt fixed shaft lines. When you said 22 megawatts, I thought you were referring to the PSC for which I have not seen any power figures. However, 20-25 megawatt range sounds reasonable considering the size and icebreaking capability of the vessel – it is in line with the recent Russian icebreakers. When designing an icebreaker, the “performance point” for icebreaking capability is where the thrust from the propellers equals resisting forces acting on the hull. This is typically the stated design goal: unless the client specifies otherwise, he should get what he asks for but not much more. If I remember correctly from the RFP, in this project it’s possible to get extra score by providing better performance, but I’d be surprised if the PSC would turn out to be significantly more capable than what is advertised. It’s quite obvious that of the main dimensions, the beam has the biggest impact on ice resistance: a wider channel means you have to break more ice. However, the impact of ice thickness is surprisingly large: 20% increase in ice thickness increases the ice resistance by 30%! That’s why there’s such a huge difference between breaking, say, 6 ft and 8 ft ice (+25 % in ice thickness means +37 % in ice resistance). If I recall correctly, these were stated as minimum and target figures for the future USCG icebreaker. However, what makes life even more difficult is that doubling the propulsion power does not mean you get double thrust. The thrust is proportional to the power of 0.67, meaning that +100 % in power gives you only +59 % in thrust. So, as a calculation exercise, let’s back-calculate a realistic power level for a PSC-sized polar icebreaker based on the Diefenbaker’s publicly available figures. Reducing the main dimensions from 492′ by 92′ by 34′ to 460′ by 83′ by 36′ and the icebreaking capability at 3 knots from 8.2′ to 6′ would reduce the installed propulsion power to about 18000…20000 kW depending on the propeller size and assuming similar bow hull geometry. I’d say 20000-25000 kW should be a realistic range for the PSC to be able to break 6 ft of ice at 3 knots. Tups, Thanks, that makes more sense. The USCG has been very consistent in saying these will be heavy icebreakers and identifying “heavy icebreakers” as those of 45,000 HP or more, so I suspect we will see the new Icebreaker equipped with three of the 12MW azimuthing propulsors for 36 MW or a bit over 48,000 HP. Earlier I saw a video of the Commandant testifying before Congress The topic was buying American made components for our ships, and he used the propulsors for the icebreakers as an example of something that could not be provided by a US manufacturer. That does not of course mean it might not be a mix of conventional shafting and azimuthing propulsors. 36 megawatts would easily push the PSC from “threshold” to “objective” level in terms of icebreaking capability. Azimuth/shaftline hybrid is a reasonable solution and would mean at least 1/3 of the propulsion system could be provided by US manufacturers. However, having three identical azimuthing units would mean less spares as at least two of the unit would be identical and the third one differ only by direction of propeller rotation. With two azimuthing units and a shaftline you’d need for example three sets of spare blades. I guess the power plant is going to be fully-integrated diesel-electric with medium-speed diesels like in USCGC Healy. Depending on the power level, I’d presume four to six engines equally split in two engine rooms. Tups, Thanks, that is the first time I have seen that. I see a maximum length of 460 feet was in the specs. Must be a basing constraint. Six engines of the same type used in the Offshore Patrol Cutter would provide almost 60,000 HP. I presume that would be sufficient to support both the propulsion and ship service electrical requirements. From a procurement standpoint, there is definitely a synergy between a Fincantieri design built in their US yard MMC and the ship’s abiliity break out of any ice enroute to homeport at any time of year (call that sea trials~). (note what happened to the LCS) We have to see how that will translate into their bid, and IF the RFP or contracting officer has any considerations for an icebreaker coming from the same parent. Those are decisions usually made at the highest level and Not often reported. In the video, I saw a small gun on the bow. And I like the modern cranes p/s as well as the multitple boat stations. TEU spots also on the bow. Good eye, Lee. I checked the video, also saw the gun on the bow, then looked for one aft and saw one on the after port corner atop the hangar. Positioned Starboard bow and Port aft would provide 360 degree coverage. Believe these would be 25mm Mk38 mod3s, so perhaps not limited to .50 cal. and smaller even as built. Wasn’t Aker Philly was also participating in the Heavy Icebreaker program? I would have thought this may be appropriate for them due to the size. This comment added to an earlier post on Feb. 23, 2017. “The U.S. Coast Guard today awarded five firm fixed-price contracts for heavy polar icebreaker design studies and analysis. The contracts were awarded to Bollinger Shipyards, LLC, Lockport, LA; Fincantieri Marine Group, LLC, Washington, DC; General Dynamics/National Steel and Shipbuilding Company, San Diego, CA; Huntington Ingalls, Inc., Pascagoula, MS; and VT Halter Marine, Inc., Pascagoula, MS.
That should give them plenty of design options. The award to Fincantieri group does not say which yard will do the work although the video and brochure both specifically call out Marinette Marine. I do think the yard in Philly is now under Fincantieri, but does not sound like they will be doing the work, at least on the first one. I didn’t think the Marinette yard could handle a vessel the size of t.his proposed icebreaker, which is why I thought of the Philly yard. Plus, God-forbid, if the Wisconsin yard was still contracted to crank out an LCS-variant as an FFG(X), then capacity may be an issue. Tups, thanks the details are clearer on these the weapons and the deck cargo of buoys and containers. I wish more people in the industry realized that the PSC is not just “yet another icebreaker” and there’s no off-the-shelf design anywhere in the world that would readily meet USCG’s operational needs. That also explains to a large part why the American icebreakers are a bit more expensive than your everyday commercial-spec icebreakers built in Europe or Asia. On the other hand, I wish some other people realized that creating a tailor-made design for the USCG doesn’t mean you have to develop the whole icebreaking technology from scratch and spend ten years honing the design. You also don’t have to or, for most of the part, can’t use existing designs as a starting point – there’s hardly anything in them that is not outdated in one way or another. Modern ships are designed to meet the owner’s specific requirements of today – why should the USCG be treated differently and be offered “historical ballast”? I have no idea what this bought. Certainly not long lead time items. Maybe just needed more money for preliminary work, but I would not have thought we would have to pay more. There is any other team competing against Fincantieri/Aker/Siemens?